Karl reMarks: The real lesson of Iraq: there are no good interventions. The real lesson of Iraq: there are no good interventions. Fate decided that the 10th anniversary of the invasion of Iraq, regarded widely as an occasion to reflect on the lessons of that catastrophic adventure, would occur against the backdrop of the on-going debate over intervention in Syria. For interventionists this represents an opportunity to re-establish a distinction between good interventions and bad interventions. Their aim is clear: to salvage the doctrine of humanitarian interventionism and dissociate it from the bitter legacy of Iraq’s invasion. This is nothing short of a wilful attempt NOT to learn the lessons of Iraq. The most honest voice in these proceedings, uncharacteristically, is Tony Blair. There was not a hint of contrition or self-reflection as Blair simultaneously defended the invasion of Iraq and called for intervention in Syria. Unlike most other interventionists who are trying to create distinctions between the mistakes of Iraq and other interventions, Blair is being truthful when he sees a continuation between the 2003 invasion and a possible intervention in Syria. Blair’s honesty doesn’t change the fact that he is wrong, really wrong. 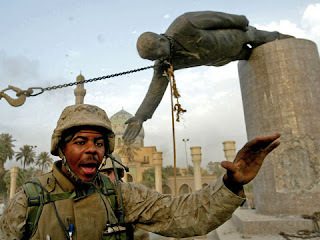 The invasion of Iraq was a product of hubris, foolishness and wrong assumptions. But so is every other humanitarian intervention. The doctrine itself is a product of a simplistic, black and white view of the world that has no patience for the subtlety and complexity. It gave Western leaders, and it’s always Western leaders, a chance to play heroes around the globe and find a new moral sense of purpose by deploying the significant military resources at their disposal. The doctrine of humanitarian interventionism is both short-termist and forgetful. Too often the long history of Western entanglement was conveniently ignored as the West recast itself as a moral actor. The history of propping dictators and arming them, plotting against national oppositions and arranging coups against elected leaders was glossed over. Blair’s embrace of Gaddafi? He had to do it but it meant nothing. A one-night stand that was easily forgotten. In Iraq’s case, the role of the West in the decades before the invasion is hardly discussed any more. Western military support for Saddam Hussein during the Iraq – Iran war, understood to include chemical weapons, didn’t feature in Bush and Blair’s image of themselves as the moral saviours of the Iraqi people. Nor did their warnings about his military capabilities allude to the fact that the US and Britain had played a big role in handing him that capability. Even more troubling, especially in the case of liberal pro-interventionists, is the total lack of reflection on the role of the economic sanctions in inflicting a huge damage on Iraqi society. The liberals’ darling Bill Clinton had ensured that the sanctions continued throughout his presidency, wreaking havoc on Iraq and bringing it down on its knees. On the eve of the 2003 invasion the country had been transformed beyond recognition as a result of the sanctions. Saddam and his cronies didn’t suffer at all, but the people had been subjected to 13 years of humiliating poverty which had a permanent effect on the country’s society and institutions. The sanctions along with the no-fly zones over the south and north of Iraq were a form of interventionist experimentation. The reasoning was if the Iraqi people were impoverished, they would eventually rise up against Saddam. There’s a clear lineage between that reasoning and the arguments that supported the invasion, as much as liberals would like to protest about the neo-con influence. While liberal interventionists like to pretend that the neo-cons ruined ‘pure’ interventionism, the two groups in fact draw nourishment from the same pool of hubris and flippant disregard for consequences. They are united in their dismissal of the idea that people can shape their own destiny, and see them as laboratory mice to be prodded, incentivised, nudged, protected, all the time seeing them as helpless victims. And needless to say, both neo-cons and liberal interventionists see themselves as elevated moral actors. Listen to the discussions about intervention in Syria today and you will hear the echoes of the Iraqi misadventure. The same confidence about calibrating outcomes, strengthening a side and weakening another, the moral obligation to intervene, ensuring likely outcomes, the same hubris and experimentation with no regard to long term consequences. Syria is not Iraq, we are reminded pedantically, as if it’s an excuse not to learn from past mistakes. The real lesson of Iraq is that there are no good interventions. Interventionism is inherently and unabashedly destructive: let’s use our big guns for a good cause. It’s a shallow, vain, reductive and trigger-happy doctrine. I would like to see your analysis of the intervention in Libya. It's not clear to me that a people can shape their own destiny when faced with a brutal and unscrupulous regime. What if they are asking for help?